Is something making you sad? There are friends you can talk to. Call these Hot line and Helpline numbers for help! Everyone, even Santa Claus, has problems from time to time. (You can imagine how difficult it is getting everything ready for Christmas Eve!) And Santa Claus knows that when you face problems in your life it really helps when you can talk to someone, whether it's someone in your family or a good friend. 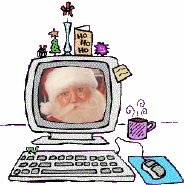 If you don't have someone you can talk to, then Santa *really* wants you to visit the website of one of the great organizations listed below or, better yet, call them right now! Each one has wonderful people who are there for you to talk to. (Think of them as elves in training! HO!! Ho!! ho!!). I may be a grumpy elf, but I know who you can call for help! There's a list of phone numbers on this page. Call the friends at these numbers if you are sad. I promise they won't be grumpy like me! Help, I am being bullied. What do I do? I'm glad you told me you're being bullied! Remember it's not your fault. Nobody deserves to be bullied. You need to tell someone you trust, like a parent or teacher, about this. You can also call a friend at one of the numbers on this page. They really can help you! When should I call a helpline?